Jefferson Bus Lines connects the UMD community and Duluth area residents, to the Twin Cities, Iron Range, and Fargo. The Jefferson Line pick up is on the UMD campus at Kirby Circle (not at the DTA bus stop), on Kirby Drive. The service is offered seven days a week. Blast off today on the new Jefferson Rocket Rider offering free Wi-Fi, satellite radio, movies, luxury seating and extra legroom. There are departures of the Rocket Rider each day from UMD. The Daily Departure bus leaves UMD each morning, and stops at multiple locations along Interstate 35, including Hinckley, Forest Lake, St. Paul Depot, Minneapolis Depot, and the University of Minnesota Twin Cities (Huron Street). The bus leaves the Twin Cities for Duluth each morning and afternoon. Regular price tickets to the Twin Cities are currently $30 one-way or $60 round-trip. Riders with a U Card or student ID will receive a discount on regular priced daily service. Specially priced 7 and 14-day advance fares are also available (no additional discounts apply). Tickets can be purchased on the UMD campus at the UMD Stores, Street Level at 1120 Kirby Drive. Please note: there is a $20 charge to reissue an unused ticket. Note: Pricing and schedule are subject to change. 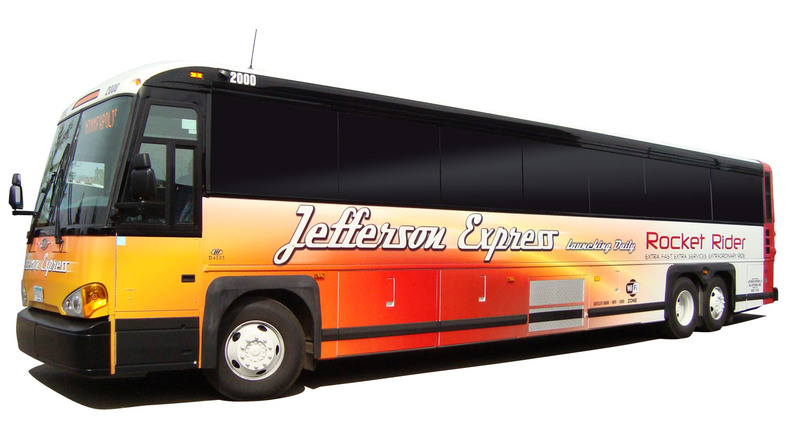 Please see the Jefferson Lines website for current fare information, and up-to-date schedule and route information.